Cricket is a gentleman’s game. Want to play this interesting game? Watch out for these deadly bowlers. You need to use your batting skills in order to score some runs. Be a great hitter so that everyone appreciates your performance in this game. You just need to adjust the batsman and hit it! 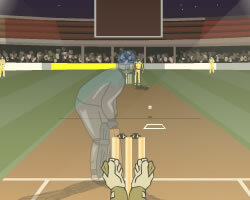 Use arrow keys to adjust batsman position. Press spacebar to strike the ball.